SHENZHEN, China, March 7, 2018 /PRNewswire/ -- Debuted at CES 2018, ILIFE A8 – the new 360-degree PanoView navigation assisted robot vacuum – has recently had its first worldwide launch on AliExpress. 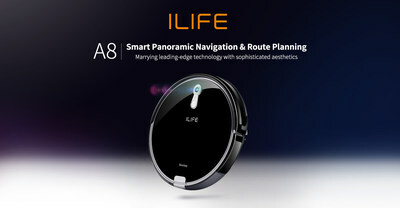 The latest model in ILIFE's premium collection, ILIFE A8 marks a great stride in panoramic navigation assisted robotic cleaning technology. Embodying pioneering artificial intelligence (AI), the new self-navigating robot vacuum demonstrates ILIFE's mission of sharing the latest technological breakthroughs with the smart home industry so that the general public will benefit from the wider application of progressive AI. "ILIFE A8 combines our latest achievements in AI and self-navigating robotic technology," says Chen Guanliang, VP of R&D of ILIFE. "The PanoView navigation system consists of a 360-degree live-vision camera and CV-SLAM graphics algorithm and three processors. These features combined give ILIFE A8's cleaning effectiveness a significant boost, presenting cleaning of the future and leading-edge AI to the consumers." PanoView Navigation: Comprised of a 360-degree live-vision camera and the advanced CV-SLAM graphics algorithm and three processors, this groundbreaking navigation system enables ILIFE A8 to clean methodically, deeply and thoroughly in less time. The Gen 3 CyclonePower Cleaning System: With the Gen 3 CyclonePower cleaning system, A8 cleans thoroughly with side brushes, a rolling brush and powerful suction in a single operation. Ultra-Thin Design: At 72mm thick, ILIFE A8 can nimbly reach and catch dust and dirt in hard-to-reach areas. Versatile Brushes: Interchangeable bristle brush and rubber brush clean all types of floor including carpet and hard floors. Robot vacuum cleaners have been introduced into homes and offices as a cleaning tool requiring no human assistance. In general, robot vacuums perform random or planned cleaning. Random cleaning models have dominated the market with their competitive price range. Although planned cleaning robots are more intelligent and cover a larger area with higher cleaning effectiveness, high technological requirements and development costs have made them a relatively costly option to the consumers. The all-new A8 is a self-navigating robot vacuum enabled by PanoView navigation system, which navigates spaces precisely with a 360-degree live-vision camera. This high-definition camera scans the ceiling to generate real-time panoramic images and perspective of its surroundings. Through the CV-SLAM graphics algorithm, visual information collected will be immediately transmitted to the three processors. Facilitating high-speed map data processing, the processor computes accurate orientation and renders a plan of the entire home. The navigation system also gives ILIFE A8 a memory through the pause/resume function. ILIFE A8 automatically returns to its charging base for recharge when its battery runs low. When recharge is done, it resumes cleaning where its task was interrupted by following the original coordinates generated by the PanoView navigation system. With the Gen 3 CyclonePower Cleaning System, A8 cleans thoroughly with side brushes, a main brush and suction in a single operation: the side brushes effectively remove dirt and debris at corners or edges; the main brush rolls up debris on carpet and hard floors, and the powerful suction collects dirt and debris into the dustbin. The i-Voice technology gives ILIFE A8 the ability to communicate with the users by reporting work progress or giving alerts in case of malfunction. ILIFE A8 also features customized scheduling which enables a preset cleaning schedule for any time. At only 72mm thick, ILIFE A8 features a seamless and durable glass top cover finished in piano black with a matching black base, making it a sophisticated, minimalistic decor in itself. The piano black finish is precisely engineered to achieve a pure dark tone and opacity, and the special coating allows easy smudge and fingerprint removal. To maintain its minimalist design, there is only an AUTO button on the top cover to meet functional needs. The top cover also serves as a release button for the dustbin – just one press on it and the dustbin will gently pop out. The design prevents dust from lodging in the dustbin slot and recirculating into the air. ILIFE A8 has two interchangeable main brushes: the bristle brush is a powerful deep cleaning tool for dirt pickup and carpet cleaning, and the anti-tangle rubber brush works best on hard floors and pet hair. Literally, there are no dead corners or impossible cleaning tasks for ILIFE A8. ILIFE A8 is being launched in March on AliExpress, reaching consumers in over 14 countries including the US, Canada, Russia, Australia, Germany, France, Italy, Spain, Singapore and the Netherlands. ILIFE A8 will be the highlighted product at the AliExpress global shopping festival from March 28-30. Other new and classic ILIFE robot vacuum models, including the award-winning ILIFE V5s Pro 2-in-1 robot vacuum, will join ILIFE A8 on AliExpress to offer the consumers special deals on leading-edge robotic cleaning solutions. For more information, visit www.iliferobot.com.